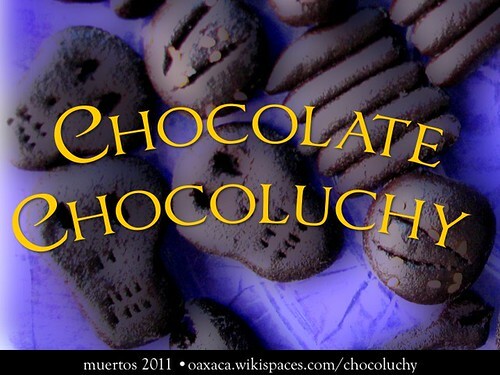 If you like chocolate and if you’re visiting Oaxaca, my personal recommendation is purchasing Lucia’s homemade Chocoluchy, a special treat during Muertos. You’ll find chocolate maker Lucia Diaz Gonzalez selling her chocolates in person at the Pochimilco Market (Colonia Xochimilco) on Fridays and Saturdays, 9am-3pm. You can find her chocolates at stores including Bambu and Grupo Lula’a. Disclosure: Yes, I do make Chocoluchy promotional materials and often receive chocolate in compensation. That said, I know good chocolate … and good people! do you have lucia´s phone number or email? we are in Mexico and would love to try here chocolate, but cannot visit oaxaca at this moment in time, maybe she can send us by post?